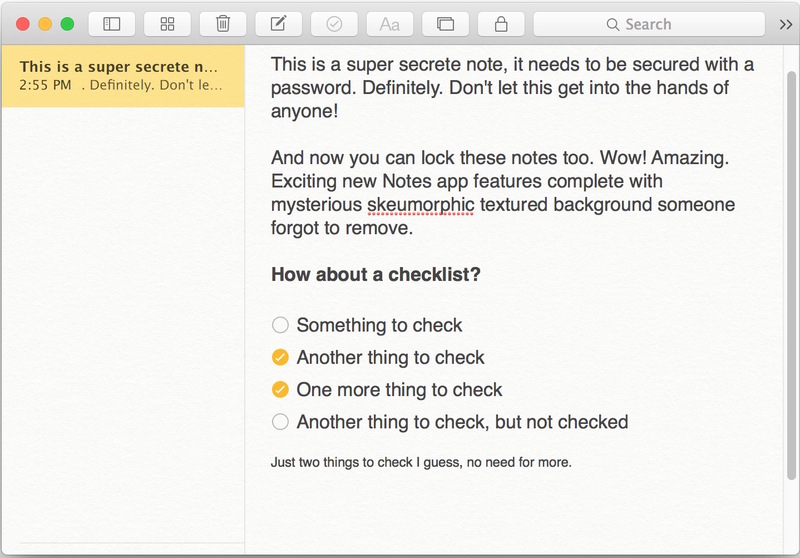 The Notes app is an excellent place to store clips of useful information, and now that you can password protect notes within the Mac app, you can securely keep more personal information within the Notes app of Mac OS X as well. This is a great feature available to new versions of the Notes app, and it allows for a convenient place to maintain all sorts of data you want kept in an additional locked layer away from prying eyes. Whether it’s a little diary, a list of login details or email addresses, insurance information, or whatever else you can imagine that is best left with a password to protect it and lock out peepers, the Notes app for Mac offers this functionality. 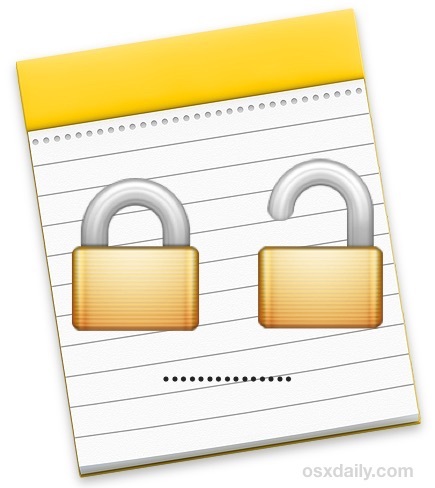 Once you have either Quit the Notes app, or chosen “Close All Locked Notes” from the Lock menu, all notes that have been locked will now require the password to access them again. 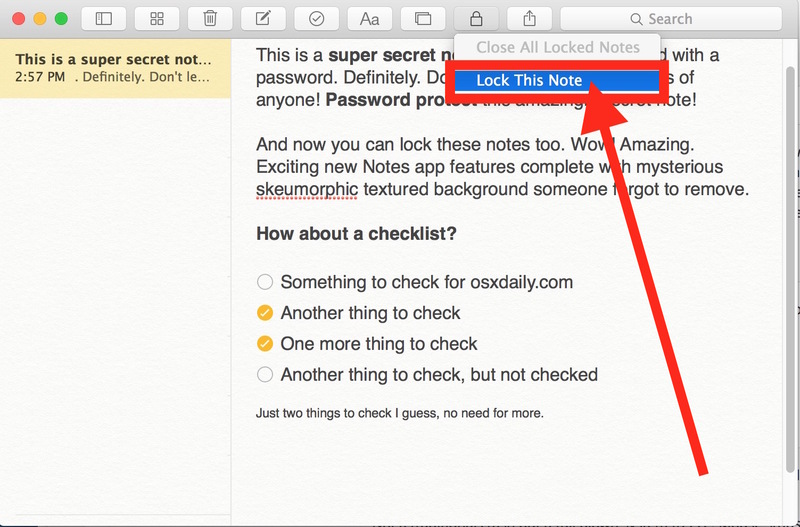 It’s important to remember to quit the app or close the locked notes like this in order to set the password protection on the notes in question. It’s also important to remember that unlocking one locked note unlocks them all, and locking one note locks all other locked notes. Currently, a different password can not be assigned to different notes. 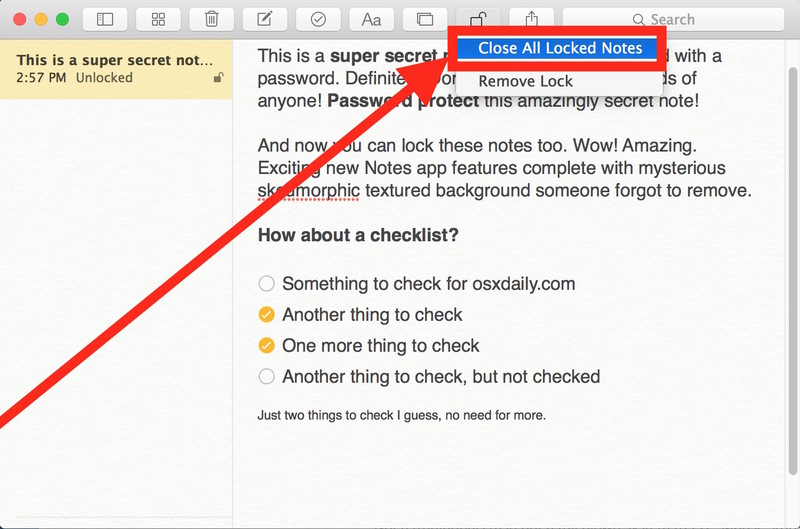 The proper password now must be entered before the lock(ed) notes can be accessed within Notes app again. Without the correct password, the notes content will remain locked and inaccessible, multiple failed entries will show the password hint if one was offered, however. Do keep in mind that even if you choose to password protect a note, this should not substitute for broader security measures on a Mac. All Mac users should have password locked screen savers that activate quickly upon inactivity, and should strongly consider using FileVault disk encryption on the Mac as well, particularly if the computer is new enough to support the feature without any performance hit (most modern Macs with SSD drives are fine). Another great feature of password protecting Notes is that if you use iCloud Notes to sync them, those password locked notes will also sync and carry over to any Apple ID related iPhone or iPad, where they will also be password protected as well. To be able to password protect a note in Notes for Mac, you’ll need to be running at least OS X 10.11.4, and to sync with an iPhone or iPad those devices will need to run at least iOS 9.3, as earlier versions do not support the feature. I tried to lock a note; but “lock this note” is grayed out. Also Notes—Set password is grayed out also. 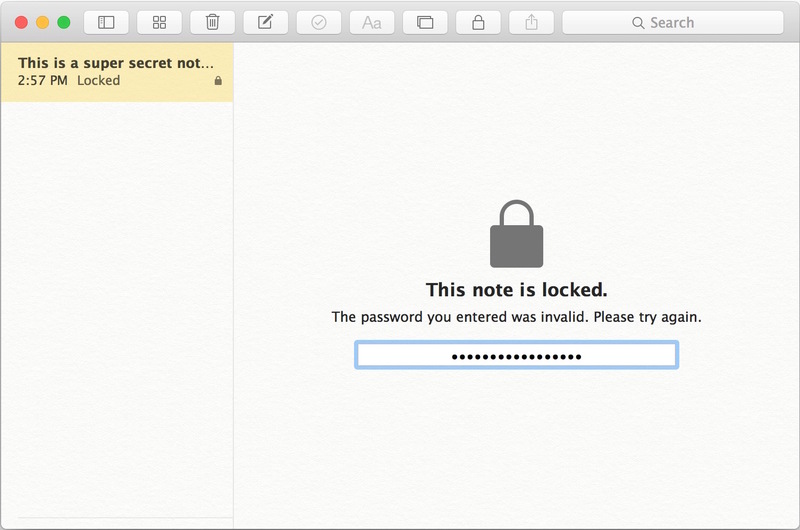 You may be trying to create a locked note with an iCloud Note that has not been upgraded yet. Click under the “All On My Mac” section so that you are creating the secure notes on your Mac only. You can secure iCloud Notes as well but they must be updated first (I don’t know why Apple does this), same thing with drawing and iOS Notes too. They do that because older software (say, syncing iCloud notes with 10.9) wouldn’t work correctly with these features. You have to switch your iCloud account which disables notes sync on anything lower than iOS 9 & 10.11 in order to use those options. What version of notes are these changes. On view i don’t see show folders. 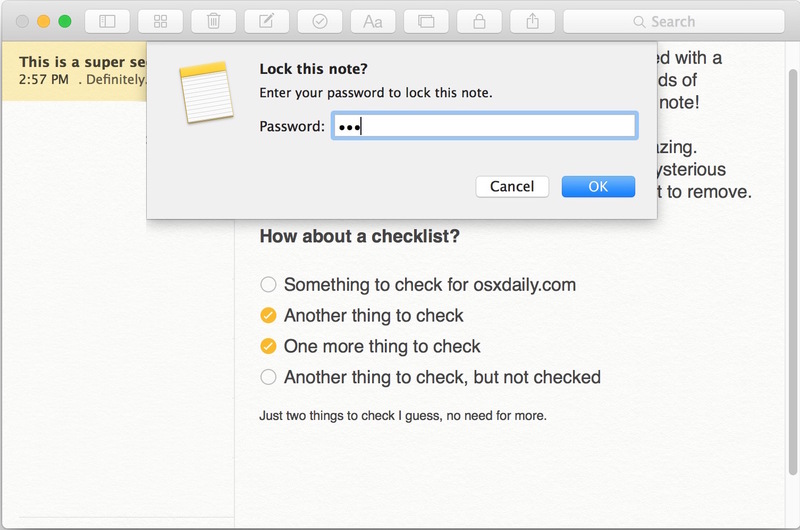 The password protected Notes feature is in OS X El Capitan 10.11.4 and later, it would not be in Yosemite. 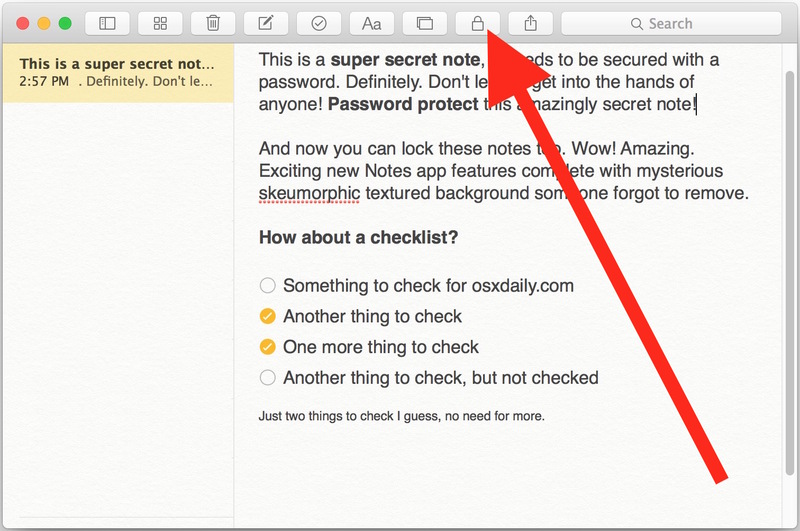 Fantastic write up on how to pass word protect Notes! Does anyone know how to sync notes from a Mac to iOS device without using iCloud? In the past Apple provided syncing of Notes via iTunes, but that is no longer an option. I’d like to sync sensitive notes that are only on my Mac to notes that are only on my iPhone and realize that I can drag the note from the Mac to iCloud, then from iCloud to my iPhone. The password protection is an added layer of privacy, but doesn’t provide encryption. Additionally, I do not want my sensitive notes to ever live on iCloud, even if it’s temporary. Anyone figured out how to sync notes “On My Mac” to notes “On my iPhone” without using iCloud? That means you are entering the wrong password, you need to use the password that you used to lock notes to unlock the notes. It has to be the same password to lock and unlock. I have notes synced with Gmail, but none of the Notes can be locked. Why?